All the Music is Live...No backing Tracks used. what you might expect to pay for such a professional entertainment solution. sixties, disco, rock n’ roll, soul, motown, current hits and party classics to make your event go with a swing! Our powerful ballads are perfect for those romantic moments too. From Frank Sinatra to Kylie, Liberty X to Abba, or Blues Brothers to the Carpenters, Kaleidoscope has it covered and special requests can usually be catered for. On stage the band shine! The stunning lead vocalist has an exceptional voice and her great stage presence and personal approach adds something special to every performance. The other highly experienced band members pride themselves in playing entirely live without backing tracks or other automatic accompaniments. which suit all venue sizes, stage and dance-floor lighting to enhance the party atmosphere and, as often forgot about by other bands, always dress impeccably. 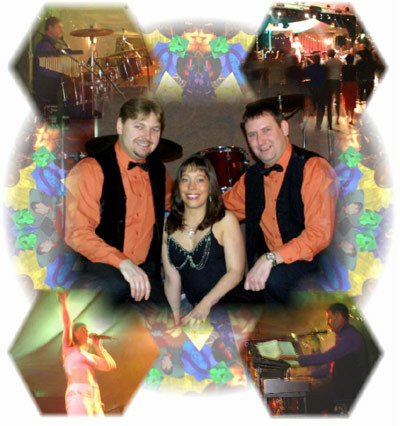 The band is suitable for a wide variety of events, and are particularly popular at weddings, golf clubs, hotels, corporate functions, Masonic lodges, family parties and dinner dances. Click on any of the links below to hear a sample of the music Kaleidoscope can offer. Please note that these are low quality MP3s samples. For a high quality demo. Please note that these recordings are completely live....vocals keyboards and drums with no overdubbing or automatics.